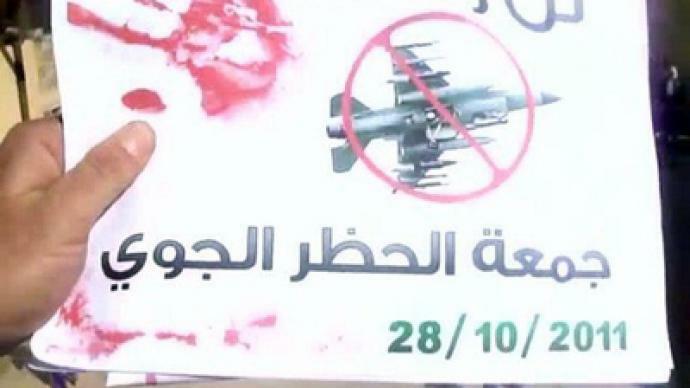 With 37 people reportedly killed by Syrian security forces in anti-government protests on Friday, opposition activists are now urging protesters to rally for a no-fly zone over the country – a move tantamount to foreign intervention. ­Stop the War Coalition activist Jim Brann believes that the reason why the US and its allies haven’t yet pushed for a no-fly zone over Syria is the country’s strategic significance in the Arab world. “Libya was seen opportunistically as the weakest link and the most productive link for intervention, whereas Syria is seen as being much more problematic,” he said. “And that’s the main reason they haven’t pushed the intervention. 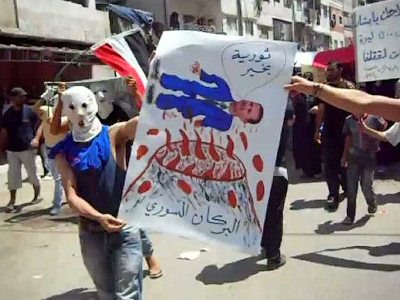 Clearly, the Syrian regime is much more firmly based than the Gaddafi regime was. 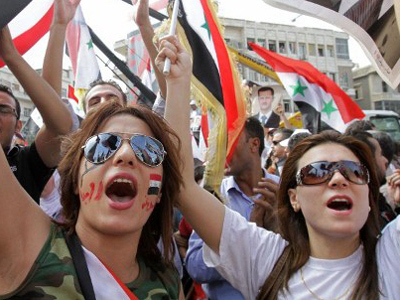 Also, Syria is much more firmly entrenched in the Arab World." “Gaddafi was clearly out on a limb and they could paint him as being some kind of weirdo, which they certainly cannot do with Assad,” Brann added. Brann believes that the West has not decided whether the intervention in Syria is in its interest, and is therefore using quite soft language when talking about the current regime. Nevertheless, Brann believes that the US and its allies could make a move against Assad's regime without a UN mandate as soon as they define their interests. 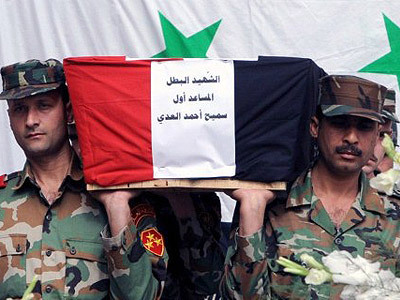 The most recent UN figures suggest that over 3,000 people have died in Syria in clashes with government forces since unrest broke out seven months ago. 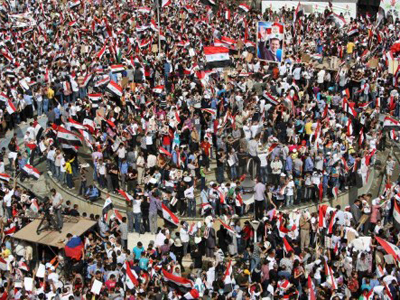 Fridays have become the main day for regular and massive anti-regime rallies throughout the country, with ever more vocal demands for a multi-party political system and the resignation of the president. The Syrian government claims that the country is facing a “terrorist threat” and is ready to present a list of more than 1,100 people killed by the protesters in the ongoing unrest. "My country has suffered numerous threats of war over the last seven months: media war, disinformation, lies of all kinds and deception," Syrian Deputy Foreign Minister Faysal Mekdad said earlier this month. On October 17, Syrian President Bashar Al-Assad said he was working on a political solution to the conflict and promised to set up a constitutional committee to debate constitutional reform with the opposition. 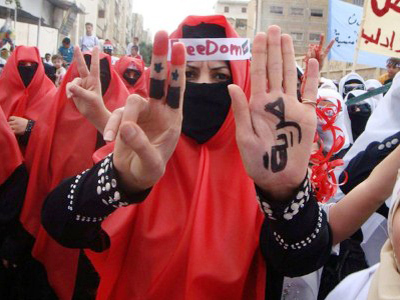 But the protesters vowed to continue rallies until Bashar al- Assad steps down. He believes that the Syrian opposition is borrowing a “page from the playbook for Libya,” as it knows it can come to power only with the support of NATO. Because the Syrian regime is stronger militarily and has more allies in the Arab world than the Gaddafi regime did, Becker argued, the Obama administration is trying to promote civil war in Syria in order to use is it as a pretext for direct intervention. A former US diplomat to Libya, John Graham, says that in asking for a no-fly zone, the Syrian opposition is actually calling for close air support. Graham doubts that the Libyan scenario would repeat itself in Syria due to its geography. Unlike Libya, Syria is a much more urbanized country, so the “possibility of civilian casualty in Syria is enormously greater than it was in Libya,” Graham added.